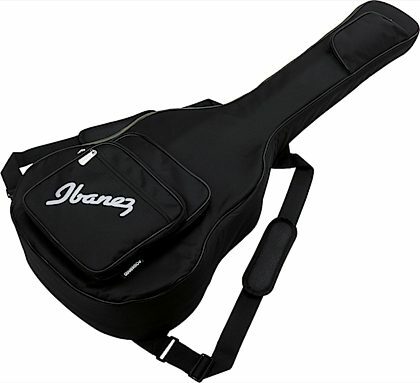 The Ibanez IABB510 Powerpad Acoustic Bass Gig Bag is a highly durable, generously padded carrying bag that is designed to fit acoustic basses including the Ibanez AEB10E and AEB5E. With firm edge cushioning of 30mm in the bottom and 15mm in the sides, the Powerpad gigbag will protect your bass during travel. The smart zipper design provides quick, safe instrument removal. Overall: This gig bag is a little tight around the lower bouts of an AEB5 acoustic bass. The zipper could possibly scratch instruments finish. Be careful when using zipper. This problem may get better as the bag breaks in. Overall: I take a short scale acoustic bass on camping trips and I wanted a less bulky gig bag. This is it. Lots of pockets for books and accessories, not super thick padding but it gets the job done. It also fits my full size acoustic bass...even though it is a tight fit. I would say the weakest link is the zipper, but what you would expect in this price range.